I spawned a couple of hundred hostile mobs into a reasonably sized bedrock enclosure, it was unnoticeable with a few mobs but as soon as their number became greater than approximately 100 they all seems to start moving into the corners of the enclosure and merging together. As the mob count increased to around about 200, the mobs were clearly sucked into each corner and compiling there, furthermore mobs would be flung at incredible speeds between the corner groups. Around 250 mobs (creepers in this case) they were just zooming all over the pen from one corner to another. 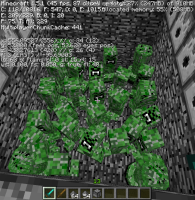 Graphical glitches are also frequent (mob model moving outside the enclosed space then zooming back to correct position) when spawned numbers are high.